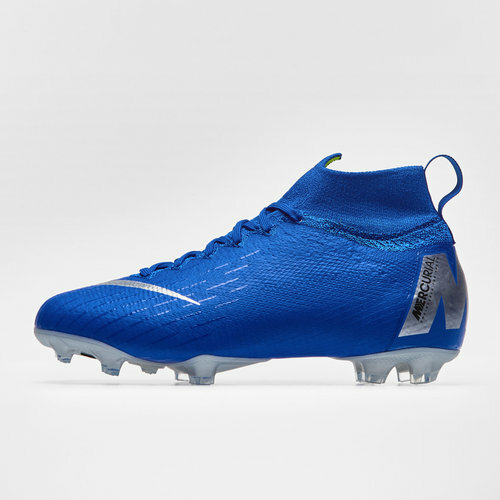 The iconic Mercurial, re-designed for the modern day superstar, these Nike Mercurial Superfly VI Elite Kids FG Football Boots in Racer Blue, Metallic Silver and Black have been built for speed and performance. You're sure to stand out in these. Wrapping your foot perfectly the 360-degree construction sits snugly around the foot moulding to the foot straight out of the box, giving you the killer instinct that's been missing from your game. Combining the leg and the foot, the Dynamic Fit Collar creates an all in one fit, increasing the strike zone. There's also no stress about playing in any conditions as the ACC provides the control come rain or shine. The revolutionary sole plate offers a split design, combining a front plate with the heel plate, ensuring flexibility and comfort when flying up and down the wings. This football boot is all about being lightweight, flexible and aggressive, so if you're a winger looking for killer instinct, this is the boot for you. These boots come as part of the Nike Always Forward 2 pack. Following on from the first collection which pitted the speed of the Mercurials against the precision of the Phantom, Hypervenom and Tiempo, Nike's Always Forward pack returns with a second edition - a fresh drop of new colourways. The new boots also come with a name upgrade with the Vapor now known as the Vapor Frenzy and the Phantom's advanced to the Phantom VSN Shadow.